Part one is marinating the chicken. 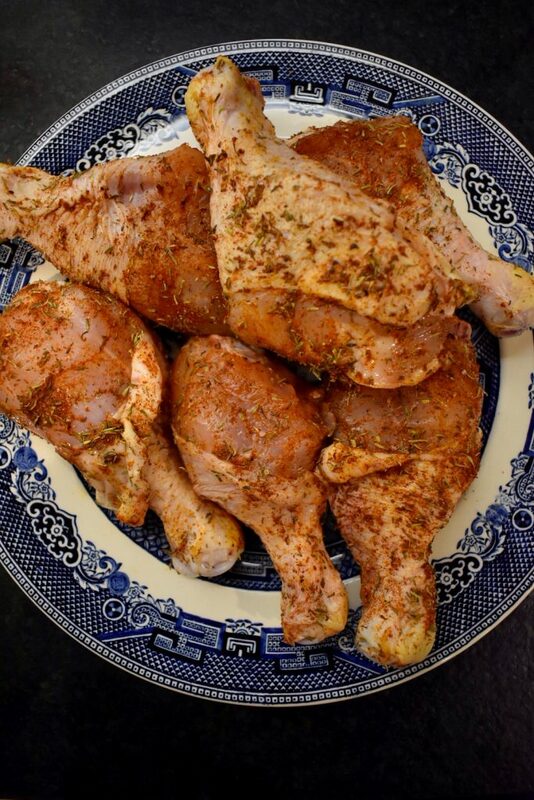 I prefer skin on, bone in thighs for this dish, but the grocery store was out (I know! The horror!) so I went with wings and drumsticks instead. I just love the way that the chicken simply falls off the bone, and the sweet crunch of the skin is what makes it all worth it. I made two batches of this recipe, marinating one batch in paprika, thyme, salt, and pepper and the other batch in garlic, rosemary, thyme, salt, and pepper (mostly because I ran out of paprika mid-marinating, another horror let me tell you). Next, pre-heat your oven to 400 degrees F. Then, in a large, oven safe, pan, melt 2 tablespoons of butter and put the chicken in the pan to sear. I went about 3-4 minutes on each side, just to make sure the skin was crispy. A trick I have learned from watching too much of the Food Network is, if you are having a hard time pulling the chicken away from the pan, then it isn’t done yet, otherwise it would easily pull away. So that should help when deciding whether or not to flip the drumsticks (or thighs). When the chicken is golden brown on each side, take it out of the pan and let it rest. Now, it’s time for the (delectable, amazingly delicious) sauce. In the same pan you had the chicken in, drain the excess fat, and then melt the remaining two tablespoons of butter. I also took some time to scrape up the fatty pieces that were stuck to the bottom of the pan, they add a ton of flavor! Next, add the garlic, stirring frequently to ensure it doesn’t burn. When it’s nice and fragrant, stir in the chicken broth, heavy cream, Parmesan cheese, and lemon juice. 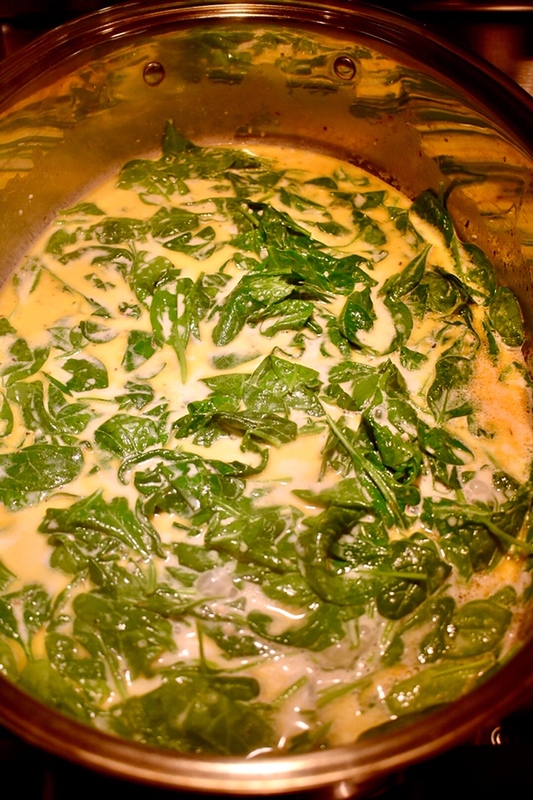 Let these ingredients boil together, stirring frequently, then reduce the heat and add the spinach. I also topped the spinach with some salt and pepper. Let the spinach wilt and the sauce thicken (it should be about 3-5 minutes). When that has been achieved, add the chicken back to the pan and place everything into the oven for about 30-35 minutes. The chicken should be 165 degrees F on the inside when it is completely cooked through. 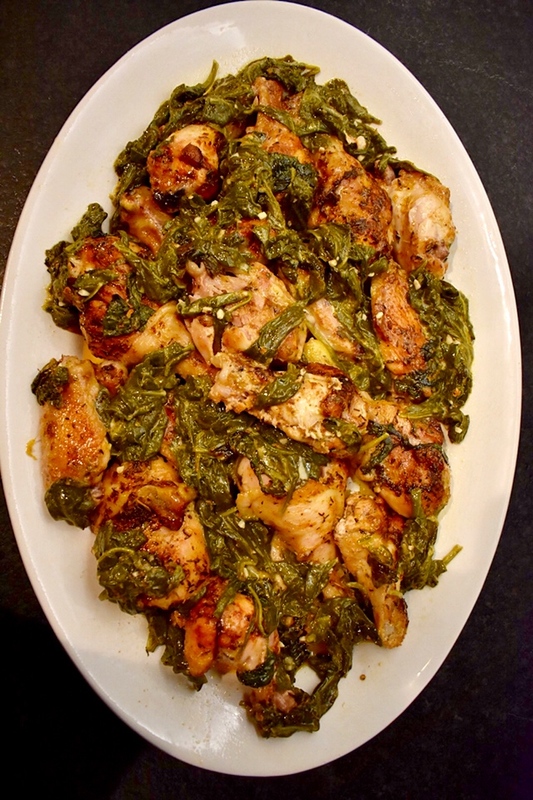 Serve hot, and enjoy this juicy, comforting dish! 2. Marinate the chicken with the herbs, salt, and pepper. 3. In an oven safe pan, melt 2 tbsp of butter. 4. When the butter is hot, sear chicken for about 3-4 minutes on each side, until chicken is golden on each side. 5. Remove from the pan, and let rest. 6. Melt remaining 2 tbsp of butter in the same pan used for the chicken. 7. Add garlic, stirring frequently, until fragrant. 8. Stir in chicken broth, heavy cream, lemon juice, and parmesan cheese, letting mixture come to a boil. 9. When boiling, reduce the heat and add the spinach to the sauce, cooking until spinach is wilted and the sauce is thickened. 10. 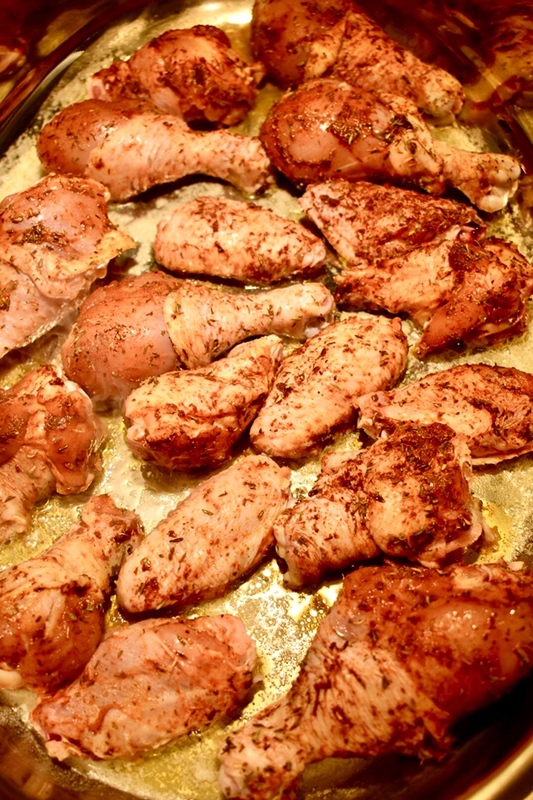 Add chicken back into the sauce, and put the entire pan into the oven for 30-35 minutes or until the internal temperature has reached 165 degrees F.
11. Serve hot and enjoy!